In the fourth summer of World War II, a team comprised of some of the greatest minds of science awaited testing of their top secret project. 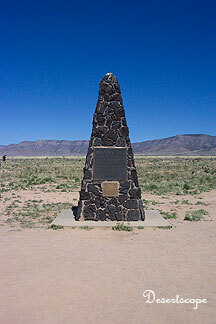 At 5:29:45 a.m. July 16, 1945 the world's first nuclear device was detonated. The effects were seen up to 400 km away. This moment marked the beginning of the Atomic Age. Every year, in April and October, the White Sands Missile Range opens up the site of the historic "Trinity Test" to the public. There are three ways to get there. One way is up Range Road 7, but that way is only available to employees of the range. 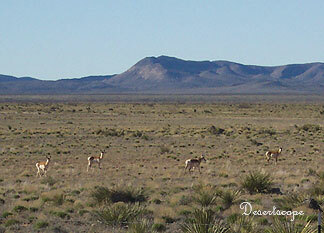 The second is to join a caravan through Tulie Gate, North of Alamogordo. The third (and best) way is to go alone via the small town of San Antonio. The drive from Las Cruces to San Antonio takes a couple of hours. If you continue past San Antonio, another 12 miles takes you to the Stallion Gate. Through the Stallion Gate, WSMR Security is there to direct you to the site itself. We arrived at around 1:00 pm. We were worried that they might be closing up shop soon. As we entered the designated dirt parking lot, I was rather surprised at the number of vehicles present. I estimated there were over 200 cars and motorcycles in the lot. The Public Affairs Office and Morale, Welfare, and Recreation Office had set up booths for information, food service, souvenirs, and gift items. The monument itself lay a few hundred yards from the parking lot. Walking to the site, we encountered a diverse mix of people. Among the visitors were Harley bikers, elderly vacationers, college students, German military and civilians, and everyone in between. Our toddler was exceptionally outgoing here, alternating running and exchanging smiles with passersby. He was more engrossed in the amazing dust clouds we was able to make than anything else. A truck in the center of the fenced-in site carried a bomb casing similar to that used in the Trinity bomb (I suspect it was the one from the WSMR museum). The monument itself is an obelisk approximately 10 feet high, bearing a bronze placard which reads: " ". A portion of the ground is protected with a 2 to 3 foot high steel shelter. The ground below the shelter is 2-3 inch layer of sand. According to the placard, the sand is there to protect a layer of trinitite beneath it. Trinitite is the name given to the fused sand and soil resulting from the explosion. Signs along the fenceline depict the people and places behind the test, as well as the blast itself. Small pieces of trinitite could be found on the ground. 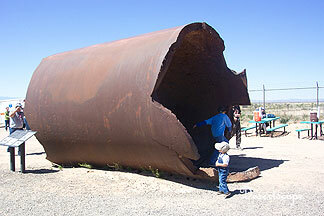 Given the Trinity Site's status as a National Historic Landmark, it is illegal to remove any materials from the site. Too bad. There were some nice pieces there. Outside the inner fence (along the way back to the parking area), a souple of WSMR employees manned a hands-on display with Geiger counters showing the radioactivity of the trinitite and some common materials. I had to rush back to the parking area (to get my toddler to the port-a-potty before he had an accident). I was surprised to see more vehicles coming into the lot. We returned to the site and looked around some more. We had to keep an eye on the toddler to keep him from entering the shelter. Aside from that, he had a keen interest in the truck. As we walked back to the parking lot again, a couple of busloads of Boy Scouts appeared. I was amazed. Considering that this was a site of historical interest rather than amusement interest, there seemed to be an inordinate number of visitors. It turned out that, for the April 2005 open house, they had a total of 3,224 visitors. On the way back, we stopped in at the Owl Cafe. I had been told that it "isn't as good as it used to be", but we gave it a shot anyway. We had Classic Owl Cheeseburgers, Chile Cheese Fries, and Onion Rings. It was kind of a dive, but not in a bad way. It was very efficient (this was probably the busiest day of the year for them). The burgers were very good. I would have had another, but instead I split one with my son. The fries were actuall made with green chile, rather than beef chili. As with all things made with green chile, you have to eat them quick, or they will absorb the water. It was a little pricey for a roadside cafe, but I thought it was worth it.